ABSTRACT: This paper presents a performance evaluation of Shunt Active Harmonic Filter (SAHF) for harmonic compensation, using Particle Swarm Optimization algorithm for DC link voltage regulation. Particle Swarm Optimization algorithm is used to search for the optimal PI control parameters. The simulation results show that the performance of Shunt Active Harmonic Filter (SAHF), where current is generated using instantaneous real and reactive power(p-q) theory, using PSO technique for six pulse controlled rectifier under different firing angles is simple in structure and very effective for harmonic compensation. The simulation is done with the help of MATLAB-SIMULINK tool box. Fig. 3. 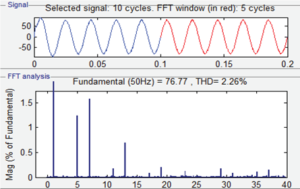 FFT analysis of source current (phase a) without SAHF. Fig. 4. 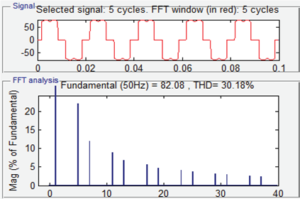 FFT analysis of source current (phase a) of SAHF for 􀍲􀍲firing angle. 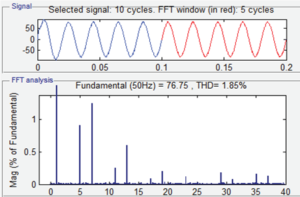 It can be concluded from the simulation results that with the application of SAHF in parallel to controlled rectifier, harmonics present in the source current are mostly compensated. The DC link voltage is controlled by PI controller, which when optimized using Particle Swarm Optimization Technique further reduces the THD value of source current. The values of THD in phase a, b and c of source current are 30.18%, 31.54%, 31.74% respectively. Further it is analyzed that by optimizing the gains of PI controller the THD values are further reduced from 2.66% to 1.85% for 􀍲􀍲firing angle. 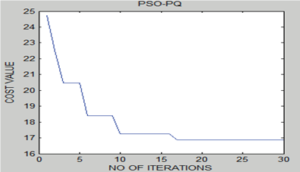 Thus we can clearly state that optimization of PI controller using PSO further reduces the harmonics on the source side. M.H.J. Bollen, “What is Power Quality?”, Electric Power Systems Research, Vol.66, Iss. 1, pp. 5-14, July 2003. H. Akagi, Y. Kanazawa and A. Nabae, ”Theory of Instantaneous Reactive Power and Its Applications”, Transactions of the lEE-Japan, Part B, vol. 103, no.7, 1983, pp. 483-490. Ned Mohan 2002, ‘Power Electronics: Converters, Applications, and Design’ 3rd Edition’, Wiley publications. F. Z. Peng, H. Akagi and A. Nabae, “A New Approach to Harmonic Compensation in Power System a Combined System of Shunt Passive and Series Active Filter”, IEEE Trans. On Industry App., vol. 27, no. 6, (1990), pp. 983-990. Hamadi,A , Rahmani,S & Al-Haddad, K 2010, ‘A hybrid passive filter configuration for VAR control and harmonic compensation’, IEEE Trans. Ind. Electron., 57(7): 2419–2434. This entry was posted in Blog, website and tagged Controlled rectifier, Hysteresis current controller, P-q theory, Particle Swarm Optimization Based Shunt Active Harmonic Filter for Harmonic Compensation, PI controller, PSO, Shunt Active Harmonic Filter. Bookmark the permalink.